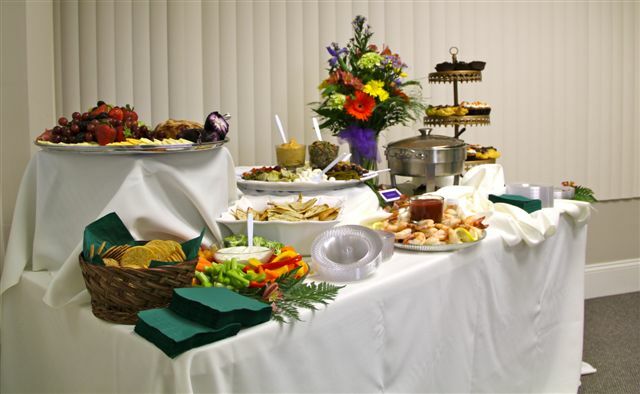 Gerry works with you to create the perfect, balanced menu for your event. Here is an example of a recent menu! Assorted mini sandwiches to include: Vegetarian wraps, Baked Buddha Ball ham and Swiss, Fresh Roasted Turkey. Cheese Tortellini w/ Roasted Vegetable Salad, Caesar Salad with fresh grated Parmesan cheese and homemade croutons. Caesar dressing on the side. Mesclan field green salad with all the accoutrements. Broiled maple glazed salmon with pineapple salsa, Stuffed chicken breast with roasted potatoes and grilled vegetables. Assorted artisan breads.Includes: upscale plastic service wares. Service labor, tables, chairs, linens (if needed) etc. additional State and local tax additional. Gratuity optional.